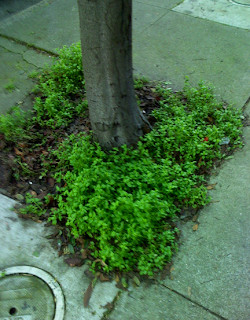 pseudobunny & co.: How to avoid the SF winter blahs..
How to avoid the SF winter blahs..
We have been doing some serious fixin' in the backyard (I will take some photos tomorrow and post them soon) and to our tree on the front sidewalk. We bought some redwood chips when we planted in late spring/early summer 07- much to our neighbors dismay. 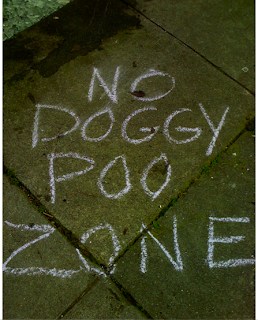 They said the weeds would come back (they did) and the dog owners would still leave poop there (they did too). 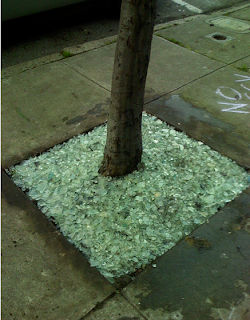 So we dug up the dirt about an inch down and put down some plastic sheeting that is supposed to prevent weeds from coming through and put down all the glass bits we got from a window display that was being dismantled up at Shoebiz. I wanted to use the glass for something in the backyard but with all the organizing and niceness back there I just couldn't see any good use for it admist all the pretty green that was coming up. Osky also got a late gift from his Aunty Cheryl (etal) and he loves them. 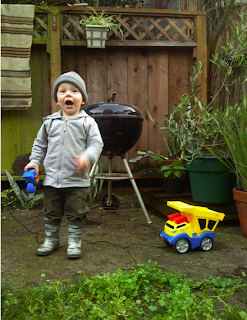 This is a picture of the remote tonka truck. While he has not fully grasped the concept of the remote control he did enjoy using the button that makes noise and sitting on it. She also gave him some legoish blocks - and of course he used them as pseudobinoculars instead of building with them but he is getting the concept.